A struggling movie producer attempts to lure a reclusive actress out of retirement. It's difficult to imagine the average modern viewer finding the patience to put up with Wilder's often rambling film, but those afflicted with cinephilia will find plenty to admire here, particularly in its lush visuals - Fedora is a study in exquisite shot composition. By the late 1970s, most of the filmmakers associated with Hollywood's Golden Era had hung up their megaphones, having found their work unable to resonate with a changing audience. Not Billy Wilder; far from hiding out in his Hollywood mansion like his most famous creation, Sunset Boulevard's Norma Desmond, Wilder continued to make movies on his own terms - alongside his long-term scriptwriter IAL Diamond (who jokingly referred to himself as "Billy Wilder's typist") - right up until 1981's commercial and critical flop Buddy Buddy finally killed his career. The director's '70s efforts won't crack too many 'Best of Wilder' lists, but while none of them are outright turkeys, none are entirely disasters either. With the benefit of history, and the ability to view it in the context of Wilder's career and the era of its production, 1978's Fedora becomes a somewhat fascinating curiosity piece, if not a wholly satisfying watch. Wilder reunites with his Sunset Boulevard and Sabrina star, William Holden, who plays Barry Detweiler (say that name quickly enough times and it begins to sound a lot like Billy Wilder), a struggling independent producer who arrives in Corfu in an attempt to lure the reclusive 67-year-old Fedora (Marthe Keller, or is it? ), once Hollywood's greatest female star, out of retirement. However, as the opening sequence and Detweiler's narration has already told us, Fedora will commit suicide two weeks from the time of his arrival. The movie's first half recounts the events leading up to Fedora's tragic demise, as Detweiler tracks her down on a remote island, where she lives with an aging Countess (Hildegard Knef), a live-in plastic surgeon and physician (Jose Ferrer at his laconic best), and a stern English maid (Frances Sternhagen), the three of whom seem to control every aspect of her life. There are echoes of Hitchcock's Vertigo and Wilder's own Sunset Boulevard as Detweiler becomes obsessed with freeing the woman he once had a fling with (as seen in flashbacks) from the clutches of this odd trio. As we learn in a midway twist, all is not what it seems with Fedora. It's a pretty knockout reveal, but the trouble is it comes a mere hour into the movie, the rest of the running time spent explaining its mechanics in largely tiresome fashion through a series of redundant flashbacks where one or two would have sufficed. Fedora feels very much like the product of a filmmaker working out of his era. It's shot with an elegance and a painterly grace missing from the average American movie of the '70s, most of which strove for realism first and foremost. Yet, if someone told you this was a Brian de Palma movie, you may well fall for the ruse. With its coarsely overdubbed actresses clad in large sunglasses and involved in a mystery plot regarding their identities, at times you could be forgiven for believing you're watching a Giallo. Were it not for its period details, you might even mistake it for a recent Almodovar. On its release, audiences found Fedora largely unintentionally amusing. Much guffawing could be heard during the subplot involving Michael York, playing himself as the object of Fedora's girlish infatuation, an element which still provokes amusement for anyone familiar with the mild-mannered star. It's difficult to imagine the average modern viewer finding the patience to put up with Wilder's often rambling film, but those afflicted with cinephilia will find plenty to admire here, particularly in its lush visuals - Fedora is a study in exquisite shot composition. Wilder was 75 when he made his last film - 11 years younger than the current age of the still prolific Clint Eastwood - and lived to an enviable 95. What might the great director have offered us throughout the '80s and '90s, had he continued to work? Deleted scenes, a restoration comparison featurette and a booklet with new and vintage writing on the movie. 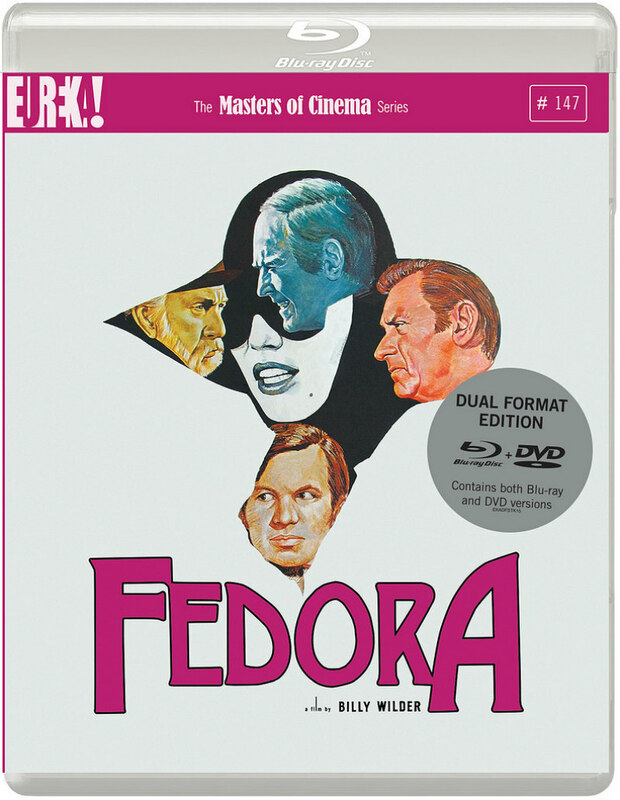 Fedora is released on blu-ray by Eureka Masters of Cinema September 26th.